More than a hundred Jewish musicians who were forced to flee Europe during the Nazi years found refuge in Argentina. Most of them came to the country with excellent musical education and having achieved significant, successful professional lives in Europe. Composers, performers, critics, musicologists, educators and stage directors (many of whom were were born in Germany or Austria) had to leave their homes and jobs on the European continent and chose to come to Buenos Aires as a place of exile. The majority of these musicians arrived in Argentina with a solid background, having studied in great schools of music (Sternschen Konservatorium in Berlin, Staatlichen akademischen Hochschule für Musik in Berlin, Neuköllner Volksmusikschule in Berlin, Hochschule für Musik in Leipzig or the École Normale de Musique in Paris) and with important teachers: Ljerko Spiller sudied with Jacques Thibaud, Georges Enesco and Diran Alexanian; Roberto Kinsky with Zoltán Kodály; Dolly Schlichter with Arnold Schoenberg and pianist Eduard Steurmann; Victor Schlichter with Schoenberg; George Andreani with Sergei Trailin, a student of Rimsky Korsakov; and violinist Ana Sujovolsky with Carl Flesch; Lili Heinemann with Louis Bachner and Anna Wüllner-Hoffmann; Herman Geiger-Torel with Lothar Wallerstein. The diversity presented by this range of schooling--which runs the gamut from traditional European concert music to the avant-garde--is evidence of the rich and varied background these musicians brought to Argentina. It is also noteworthy that some of these immigrants held significant positions in their countries of origin: Roberto Kinsky at the prestigious Dresden Opera; Ljerko Spiller was the concertmaster of the chamber orchestra conducted by Swiss pianist Alfred Cortot; Teodoro Fuchs was a conductor in Danzig and worked at the Stuttgart Opera. The violinist Ljerko Spiller had won the Wieniawski Prize, and the soprano Lily Heinemann had appeared at the Glyndebourne Festival. Dajos Béla, Efim Schachmeister, Victor Schlichter and Illia Lifchakoff had conducted successful jazz orchestras and had played in the ballrooms of various European cities: Hotel Excelsior and Hotel Adlon in Berlin, the London Palladium or the Monseigneur in Paris. They had recorded for the Odeon and other record companies of the time. The conditions upon arrival in Buenos Aires, although different in each case, corresponded to the historical moment. In some cases, family members already in the country awaited the arrival of their relatives. In other cases, an association for immigrants was ready to lend support. Although most musicians had to begin looking for work when they arrived, a few of them came with contracts already in hand. Many remained in Argentina for the rest of their lives, although others opted to return to Europe after the war or left for the United States. Among the group that stayed were musicians who dedicated themselves to composition, musicological research or music criticism; to the interpretation of European art music, tango, liturgical music or klezmer music; to the formation and/or direction of musicians' unions; to editing music magazines; to orchestral conducting; or to opera directing. Radio and film were also venues for these émigré musicians. Some held positions of leadership as orchestra conductors, violin soloists or film composers. This group of musicians included the composers Jean Gilbert, Teodoro Fuchs, George Andreani, Alexander Szenkar, Guillermo Graetzer, Victor Schlichter, Istvan Weishaus and Dajos Béla. The young Werner Wagner, Michael Gielen, Alejandro Pinto and Marcelo Koci all studied composition with teachers in Argentina. On May 4, 1939, Jean Gilbert (Max Winterfeld), a renowned composer of operettas (he had composed more than fifty of them in Berlin), arrived in Buenos Aires, where he was engaged to conduct the orchestra Radio El Mundo. The performances that took place three times a weekend provided a great impetus to the operetta genre in Argentina. 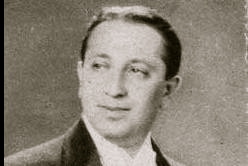 Gilbert worked ceaselessly as a conductor and operetta composer for the national cinema, but only for a few years, because he died in December 1942. He provided music for the films Novios para las muchachas (by Antonio Momplet, 1941), El pijama de Adán (by Francisco Mugica, 1942), Su primer baile (by Ernesto Arancibia, 1942), En el viejo Buenos Aires (by Antonio Momplet, 1942) and La casta Susana (by Benito Perojo, 1944). George Andreani (Joseph Kumok) arrived in Argentina in 1937 and immediately composed the music for the film Fuera de la ley, directed by Manuel Romero. Andreani had worked as a conductor and composer of thirty-eight film scores at the Barrandow Studios in Prague and the UFA Studios in Berlin and had composed the music for the award-winning film The Golem, by Julien Duvivier. In Argentina he maintained his links to the world of cinema, composing the music for more than seventy movies and working alongside such directors as Manuel Romero, Enrique Susini, Arturo García Buhr and Carlos Hugo Christensen; most of these films were made for the Lumiton Studios). Victor Schlichter composed his first piece at the age of six and, at twelve, gave his first concert in Vienna. He studied violin at the Musikschule in Vienna, then in Paris with Lucien Capet, and composition (in Vienna) with Arnold Schoenberg. He also studied with Paul Elgers. He was born in Vienna on March 7, 1903, in the bosom of a bourgeois Viennese family. The German film industry was one of the most successful in the European market, and the UFA-film production company was one of Europe's largest. Under its auspices, Schlichter launched a career as a conductor and composer of film music and, simultaneously, as an operetta conductor. By early 1933, his career in Berlin was well established. That same year he founded a successful quartet, The Viennese Bohemians, which performed throughout Europe. But with the increasingly critical situation in Europe, Schlichter, like so many others in those dark years, began to think of leaving. Together with the other members of his quartet, Schlichter obtained a contract in Argentina, which allowed him to arrive in Buenos Aires and live there with no problems. Victor He embarked on the Conte Biancamano at Genoa on December 18, 1936, and reached Buenos Aires on December 31. There he fully developed his career as both conductor and composer. He was particularly successful in the areas of broadcasting and film, which were in their heyday in Argentina. He also composed incidental music for different kinds of radio programs and accompanied popular comic actors at the radio station. Between 1945 and 1977 he composed music for theaters where his sister Hedy Crilla worked as an actress or director; these included children's theater, classical theater and Yiddish theater (including a stage adaptation of Tevye the Milkman by Sholem Aleichem, The Princess and the Swineherd by Hans Christian Andersen, Spring Awakening by Frank Wedekind and Harold and Maude by Colin Higgins. Victor Schlichter died in Buenos Aires on December 8, 1986, leaving a body of work that also included carols, fox-trots, approximately thirty children's songs and the soundtracks for more than twenty-five Argentine films, on which he had worked with such directors as Luis Saslavsky, Luis César Amadori and Carlos Schlieper. Little information has been found to date about István Weishaus, conductor and violinist, born, it is believed, in 1904. Arriving in Buenos Aires around 1934, he conducted various radio orchestras, including Radio Excelsior, Radio Stentor and Radio El Mundo. In Argentina he composed waltzes and other pieces, including Allá… en Viena (waltz); Bailando en el Broadway, Círculo romántico, Dulzura, Flores de Viena, Ondas del Plata (waltz), Pasión gitana, Pot pourri de valses, Princesa mora (paso doble), Suspiros, Brisas del Danubio (waltz) and Vida mía (waltz). The conductor and composer Teodoro Fuchs was born in Chemnitz, Saxony, Germany, in 1908. He studied conducting with Clemens Krauss, conducting and composition with Joseph Marx and Robert Heder. In1933 he fled Germany and settled in Istanbul, where he taught at that city's university. He arrived in Argentina on April 2, 1937, aboard the ship Alcyone out of Rotterdam. Shortly after his arrival, he was named conductor of the Symphony Orchestra of Córdoba. His compositions include Variaciones y fuga (1927), Sonata para violín (1937), Danza judía (1934), Suite judaica, Impresiones argentinas (1940), Sonata para dos violines y piano (1945), Sinfonía (1945), Oratorio profano, Danza oriental (1946), Ruhayat. Guillermo Graetzer was born in Vienna on September 5, 1914. From 1930 to '34 he studied at Berlin's Neuköllner Volkshochschule, where his teachers included Paul Hindemith (until his resignation), Harald Genzmer, Ernst Lothar von Knörr and Hans Böttcher, among others. He also took private composition lessons until 1935 with von Knorr and Böttcher. In 1935 he moved to Vienna because the situation in Berlin had become untenable. There, he studied composition with Paul Amadeus Pisk. Graetzer participated in various concerts shared with other composers of the modern school; many of their works were given their premieres. As the European situation became increasingly dangerous, the Graetzer family decided to immigrate to Argentina, and they arrived in Buenos Aires on January 2, 1939. In his new country, Graetzer connected with Juan Carlos Paz, who was involved in the avant-garde music scene. (Paul Pisk established the contact between them via a letter of recommendation.) During this initial stage, Graetzer was also linked to various musical events organized by Jewish – mainly Zionist – cultural associations, for which he set a considerable number of biblical texts as well as Hasidic, Yiddish and Hebrew poetry. In 1946, on the basis of the ideas he had encountered at the Volkshochschulen developed by Paul Hindemith, he founded the Collegium Musicum of Buenos Aires. There he organized music classes for children and training courses for teachers of music and dance. In addition to his role as artistic director, he also taught pedagogy and musicology and conducted choirs. He adapted the Orff Method for Latin America and published a significant number of anthologies and arrangements. In his first compositional period, which dates from the Primer Cuaderno de Lieder (1935-37) to De la Sabiduría (1957), his music was influenced by neo-classical trends. Over time, Graetzer began to write polytonally, atonally, serially and by building textures of remarkable character, manifested through his own individual style of instrumentation. From the 1960s on, in his second period, he sought a break with the Old World and explored other paths, especially the Latin American sound world. American themes — notably pre-Columbian ones — captivated him. In 1962 he composed the Preámbulo al Popol Vuh de los Mayas, and then music with texts by Spanish and Latin American writers. In posthumous recognition of his achievements, the Argentine Society of Authors and Composers created the Guillermo Graetzer Composition Competition. For most modern artists, travel has been common and necessary as a means for encountering new aesthetic ideas, opportunities for study with certain teachers or for improving economic conditions. Such networking established meaningful cultural ties throughout Europe and between Europe and the Americas. But in the lives of these musicians in particular, political conditions made the word exile an extension of the word travel. For many of these immigrants, one exile was followed by others. Thus, the original other place was no longer just Palestine but also Germany, Austria, Poland, Russia and other countries affected by Nazism and World War II. For many of these musicians, arrival in Argentina reflected their hopes for social, political, cultural and economic success. Having been expelled from their native countries, they searched--not without difficulty-- for ways to continue their work in music. In the course of adapting and integrating, they learned a new language, often changed their names, and established ties to a new musical environment. In conceiving of artistic practices as a network of collaboration among individuals, I acknowledge the contributions of sociologist Howard Beckerii and, following his model, interpret the activities of the Jewish musical community in Argentina as an art world, that is, a model of collective activity organized and later reified in the creation of, or participation in, diverse musical institutions, such as chamber ensembles, orchestras, educational institutions, and professional associations. Becker's idea is that all artistic activity is a social phenomenon; that is, an activity involving a group of individuals related to a particular area and a given historical context, one that evolves in a certain social direction, which manifests itself among the individuals involved in this enterprise. According to Becker, there are two types of solidarity among these individuals: one that is related to these individuals' origins, and one that is related to subsequently developed professional affinities. All of these musicians faced exile, but - without ignoring or forgetting their painful past - they created and left behind an important legacy in all of Argentina's musical spheres.